According to Statistic Brain, Facebook has 1.3 billion active monthly users. Yes folks, it is billion with the alphabet “b”. Facebook wants to be the Next Big Thing and they want it to be the one platform that everyone visits on a daily basis. Algorithms are constantly changed to ensure that users like you and me are getting the best results in everything that we do on Facebook. Let’s face it, Facebook marketing can be really challenging. With the insanely numbers of algorithms get updated on a weekly or monthly basis, monitoring everyone of them is close to impossible. With the fast paced marketing industry, we definitely don’t have time to keep track of everything. So, here’s what you will get in this post. You’ll find the best tools that will help you leverage the true power of Facebook marketing — both paid and free ones. It doesn’t matter if your goal is to capture the attention of your followers, building a bigger following or to increase visibility; these tools will help you one way or another. Yes, you are right. Facebook Insights is a super-duper powerful tool if you use it correctly. It doesn’t cost you a dime to use it and it is certainly accurate (considering that the stats are based on Facebook database) to certain extend. I use Facebook Insights for both paid marketing on Facebook and to create a buyer’s persona. This tool allows you to craft the right audience that will most likely engage with your content. Age, gender, location etc — you got them all under one roof. To start using Facebook Insights, head over to your Facebook profile and search for ‘Facebook Insights’ on the navigation bar on the left. Alternatively, you can click on this Facebook Insights. Agora Pulse is a pretty awesome social marketing tool. Currently, it integrates well with Facebook and Twitter. Agora Pulse provide a complete list of Facebook marketing, namely photo contest, fan vote, coupon quiz and sweepstakes. What makes this tool so powerful that it integrates seamlessly into Facebook pages for easy management. It comes with both free and paid plans. The only difference between both of them is the number of participants allowed per Facebook campaign. Paid plans start at $29 per month. If you are looking for a tool that does all the job for you in terms of reporting and stats, Compass is the one you should be using. The tool is pretty straight forward to use and there is near to non-existence for learning curve. I often consider Compass as Facebook Insights on steroids. Important information such as age, gender and countries are beautifully layout for better user understanding. Another huge advantage using Compass is that you can compare your report with others from the similar industry. This is because Compass collects data from various industries each time it is used. EdgeRank Checker is one of my favorite Facebook marketing tool. It provides comprehensive overview and analysis of Facebook pages. Plus, to further increase the understanding level and reduce the time of analysis, it comes with some awesome charts and graphs. EdgeRank Checker comes in two forms — free and paid plans. In paid plans, users are able to get advanced features such as popular metrics and page recommendations. This tool is part of Agora Pulse (yes, you hear it right) and it delivers tons of goodies for your Facebook marketing. If the above doesn’t convince you, I am sure this will. Facebook Page Barometer is free to use. Have you come across issues such as Facebook is pulling the wrong snippet from your blog post? Or maybe there isn’t any preview when the link is shared? Facebook URL Debugger tool is one of the most-have for serious marketers. You can use this tool to check on any link or website and it will return a report on the link. For developers, the information gained from Facebook URL Debugger is golden. And yes, it is also free to use! Yes, I’m cheating a little but here goes. Headlines are important as it can affect your CTR. Studies have shown that an average human attention span is between 6 to 8 seconds. With the right headlines, you are going to attract potential readers instead of totally losing them. Entering a link into the CoSchedule Headline Analyzer and it would analyze the link. The result would be displayed in the score form from 1 to 100 (100 is the best). You will also receive recommendations to improve your headlines (which are backed by science). Most Facebook marketing tools are based solely on Facebook pages but what happens when you want to know about your personal profile? Also, did I mention that this tool is absolutely free to use? If you are looking to create massive engagement on Facebook, you got to use Post Planner. With Post Planner, you can literally search for the most popular content on Facebook which includes links, images and status updates. These contents are pulled from all over the world, including posts from top Facebook influencers. If you are into Facebook marketing and needed assistance, AdRoll is the service you would need. AdRoll comes with massive features to take your Facebook advertising from good to great. AdRoll is not that cheap to use but if you are focusing on retargeting, you are going to love this tool. Let’s face it. 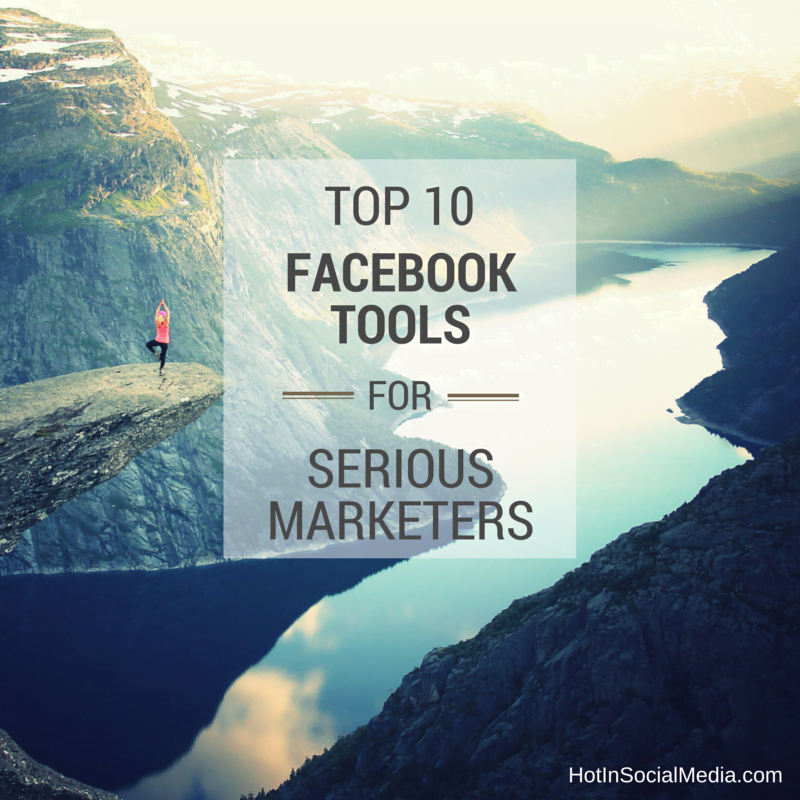 There are many Facebook tools out there to use and most of the tools are great ones. All you need to do is to determine your ultimate goal and then, decide on the best tool to work with.